SEOUL—During rare talks credited largely to President Donald Trump’s foreign policy, North Korea agreed to send a symphonic orchestra to the South to perform at the Winter Olympics next month. Officials from the two Koreas—technically still at war after their 1950-53 conflict ended in a truce, not a treaty—met on the North side of the border truce village of Panmunjom to discuss North Korea sending 140 performers—for the first time in 18 years—to the Olympics in Pyeongchang. South Korea’s president credited Trump for forcing North Korea to come to the table and thanked him for bringing the two nations closers to a broader peace agreement, New York Times reported. The North will dispatch a preliminary inspection team “at the earliest possible time” to hammer out logistics such as the performance venue, stage conditions, and the installation of equipment, according to a joint press release. 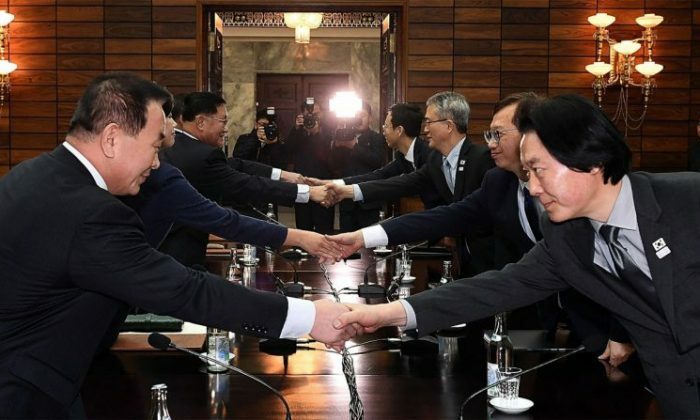 The two Koreas separately agreed to hold working talks on Wednesday on the North’s athletes attending the Olympics, the ministry said. They will also hold talks hosted by the International Olympic Committee (IOC)on Saturday. The North’s orchestra, called the Samjiyon Band, is the country’s main art troupe along with the Moranbong Band, women who regularly stage musical performances and plays calling for loyalty to the communist dictator. During the orchestra’s New Year performance last year in Pyongyang, a large screen placed behind the staged displayed footage of the North’s long-range missile launch and what it claimed was its first hydrogen bomb test in 2016, calling it a “complete success,” a video clip posted by state media shows. The North said during the talks it plans to play traditional folk songs which “fit the mood for unification and are well known in both sides,” as well as classical music, Lee, the South’s negotiator, told a news conference. “The choice of a symphony concert is to avoid any potential controversy because there are very few modern North Korean pop songs that don’t carry a political message,” said Cheong Seong-chang, a senior fellow at the Sejong Institute think tank in South Korea.